Ask the Readers: How have higher gas prices affected you? With higher gas prices being the norm these days, how have they affected your lifestyle? Do you drive less? Have your driving habits changed? From where I live to my work place, there are very limited public transportation routes, so driving my car is pretty mandatory. Even though I still drive every day, I practice various techniques and strategies to save gas. To start, as we own two vehicles, one is smaller and more fuel efficient than the other which means the gas guzzler sits in the driveway more often. In addition to that, my driving habits have changed where I’m more conscious of the added gasoline expense. I find that I’m little lighter on the pedal, checking tire pressures more often, and keeping unnecessary items out of the car. I even look forward to driving/drafting 2-3 seconds behind large trucks on the highway as it will reduce wind drag on my car. Note that drafting is not recommended for everyone as it can be very dangerous. So back to the question at hand, in the era of $1.50/L ($5.67/gallon) gasoline, has your lifestyle or driving habits changed with higher gas prices? Not too much. I was considering bike for a while, but after some calculations it turned out that I will still go to work/trainings by car. I always used different strategies to increase fuel efficiency, so there also nothing changed. I didn’t change my habits so far. The only difference is that I was planning on buying a SUV within the next 2 years. Now, I am thinking to keep my 4 cyl Mazda a little bit longer until they offer more hybrid SUV’s. The Lexus RX 400 seems great… only 55K… plus taxes ;-0 hahaha! My wife works across the road from me, so we carpool in together. When I bought my car in ’05 fuel efficiency was one of the deciding factors. Plus we don’t drive all that much – so I only end up filling up every 7-9 days for low $50s. I have certainly made more of an effort to share a ride to work with my wife rather than taking separate cars, even though it is less convenient, and I also find myself driving a little more passively and shifting earlier. It hasn’t changed my behaviour in any major way, but there are little things like that. If nothing else, I find myself more conscious of my fuel usage. FT, let me give you one piece of advice from someone who has done it many times- DON’T DRAFT TRUCKS. In order to experience any notable fuel savings, you need to get dangerously close to the truck. It’s an extremely unsafe practice, regardless of how confident you feel in your abilities. Saving a few dollars isn’t worth getting yourself killed. MGL, Yes, you are absolutely right, drafting that close is very dangerous indeed. I usually draft around 3 seconds behind, are you saying that there is no benefit in this? I wouldn’t say no benefit at all, but very little benefit. MythBusters did an episode on this last year and found that following a truck 100 feet back at 55 mph resulted in 11% fuel savings. At 55 mph, 100 feet is only about 1-1.5 seconds back. As you move further back to the safe 2-3 second range, your fuel savings disappear. Interestingly, they did find 40% savings if you draft just 10 feet back, but this is an insanely dangerous following distance. Yes, I’ve done it, and no, I wouldn’t ever do it again! 100 feet back isn’t horribly unsafe, but it’s closer than you should be. The recommended safe distance at that speed is about 240 feet (3 second rule). Props to MGL on that note. I love Mythbusters. I managed to convince my company to pay for commuter rail for me. It saves me a load of cash in both gas and maintenance and it also takes a huge amount of stress off my shoulders. I would love to bike to the train station, but it is not feasible due to weather considerations and the attire that the job demands. However, I heard that Metrolinx (the GTA Transit council) is planning on making ‘Hubs’ that would include bike lockers, showers and a change room. If that happened I would ditch four wheels for two. I use a motorcycle for my daily commute, which I’ve been doing for about five years, so that’s no change. My wife works from home, so her commute is a real gas-saver. The only place I’ve cut back is on unnecessary trips to the bookstore, sporting goods store, hardware store, etc. I am considering buying a more fuel-efficient vehicle when we replace our ’98 Taurus this fall. It is amazing what can be accomplished by bicycle in everything but deep snow. When living in Toronto, I ended up selling my car after a year there and switched completely to bike and TTC combo (mostly bike though). In other cities like Victoria and Fredericton, I relied mostly on the bicycle since the public transit systems are somewhat abysmal. Showers and change facilities at work are a big hang-up for many, but there are many ways to reduce the impact of self-propelled commuting: carefully choosing the right next of skin clothing and rain gear, taking your time to avoid heavy perspiration and allow sufficient cool down before changing, leaving suits at the office (one company let me keep dress shoes and attire in an unused closet), etc. Not for everybody, but the cost/benefit ratio is outstanding. Aside from the financial advantages, the biggest benefit is the head-clearing aspect of the activity pre and post work. All that said, I miss having a car and would consider a car-share program if it were available in my city. I think many bundle gas into the cost of membership. I’ve cut back quite a bit. My commute to work is about 10km. Previously I was going home for lunch, so I was driving a total of 40km every day. I’ve started brown-bagging it, so I’ve effectively cut my gas bill in half. Next year, if gas prices continue to climb, I’ll likely be purchasing a motorcycle for the commute during the warmer months. It’s not as beneficial here in the Yukon as it would be in other climates, as I’d only really be able to ride four or five months out of the year, but if gas is high enough it’s worthwhile. When I calculated it out earlier in the year, the gas savings only just covered the cost of insurance for the bike, but the price has gone up by about 20c/L since then. I now commute to work.. This should save my gas expense by 50%.. Using rewards credit cards that give me 3% cash back. My daily commute adds up to 260 km round trip to work. I car pool with another fellow worker so I’m driving every second day. I drive a fuel efficient Mazda 3, keep the cruse at a constent speed and service the car at regular intervals. A lot of people rely on their cars to live their daily lives and they don’t have much of an option but to continue devoting more of their budgets towards gas. Apart from making a drastic lifestyle change or large investment in a fuel efficient car, the only easy change you can make is to spend more on gas and less on other things. Higher gas prices have not changed my behavior at all! I guess that’s not entirely true. Let me back up a bit. My family has one vehicle which we drive sparingly (<60k kms in the 4.5 years we’ve owned it). I take public transit to/from work, occasionally catching a ride. We try walk to the store/library/videostore which would otherwise be little trips with the minivan. While it pains me to hand over the credit card when I’ve filled the vehicle for $90 or so, I’m still only filling about twice per month so it’s a cost of $60 more per month. We are pretty mindful of our spending but gas, for us, is pretty much a utility cost. Its changed the way I live quite a bit. In previous summers, I would have spent a lot of time in Laughlin, NV with the family on the boat. With gas prices as high as they are, we’ve only made 2 trips out there this summer compared to our normal 10 or more. Another thing that will be affected is the upcoming desert riding season. All these toys run on gas, so we’ll see how that goes. I used to drive the 40 miles one way to the ice rink to play hockey twice a week. Now I’ve cut it down to only once a week. It seems like we’re making a lot of sacrifices. Once my SO has a job again, I’m sure we’ll get back into the normal routine of things. We structure our lives around not needing to drive. For other reasons, but it’s saving us cash now too. I don’t drive and most of my husband’s driving is for work, and is reimbursed as mileage. Plus they bought him a GPS recently! So purely in terms of petrol costs we’re not hurting. Now flights we’ve taken recently …. Hasn’t really affected me at all. My commuting costs have gone up $9/month (TransLink upped their rates 50c/ride, which ups the monthly pass by $9); food prices are a bit higher now, but not so much that it’s changed my purchasing decisions; and I didn’t own a car when gas was 90c/L, and I don’t own one now. I bike more than I used to, but that’s because it’s a lovely summer, not because gas is more expensive. Guinness has a great line here: We structure our lives around not needing to drive. My wife and I have done the same (voluntarily) and the cost savings are immense. I’ve spoken with lots of people about the issue and I honestly think the reason it’s getting so much press (and is such a crisis), is simply that many people have structured their lives around the availability of cheap gas. People bought houses that were miles from anywhere useful, they took on jobs that were a long way from home without factoring transportation costs or time. They accepted jobs where no public transportation option exists, but then didn’t ask for a pay premium to compensate for the extra car cost. I know lots of these people. Now they all whine that gas prices have gone up (like it wasn’t some foregone conclusion). I was telling people that gas was cheap at a loonie, I’m telling people that gas is cheap now. But Mining sums it up: Apart from making a drastic lifestyle change or large investment in a fuel efficient car, the only easy change you can make is to spend more on gas and less on other things..
Cars were already expensive before gas jumped, but we humans are really good at “ignoring” total cost of ownership. However, gas is like a weekly reminder of how much money we’re spending, so it starts to wrack our sensibilities. I’ve definitely had to make some adjustments. Fortunately I live pretty close to work, but I try to combine errands, especially if I’m going to be in a part of town that’s far from my house. My family lives 2 1/2 – 3 hours away, and I haven’t visited them in months — I used to drive home and visit every other month, but those visits are mainly just for special occasions now (the drive to and from goes through a lot of gas, and my parents live at the opposite ends of town, so I have to do a ton of driving while there, too). I also have majorly cut back on eating out and have begun cooking at home much more often. I really wish I lived somewhere with a good public transportation system, but all we have in Austin is a mediocre bus line that most people wouldn’t be caught dead on. We had decided that this was the year to drive to the Yukon, so we are in the process right now. We’ve gone about 5,000 km from the Toronto area and we’re currently in BC. It is truly awful to see how much we are spending in gas, even though we knew we would, it still hurts. We do a lot of road tripping as the husband doesn’t fly. I keep sparse notes on our trips, such as where we stay, how many km for the day, hotel prices, gas prices. To look at the past trips and see the gas purchases and compare to today is alarming. Everything else is reasonable – food, lodging, misc, but the gas…… Anyway we are having a blast and will have to do some budget tightening upon our return. No way were the high prices of fuel going to stop us from our mission! My wife and I have commuted together for over 5 years and have enjoyed our short 10km round-trip commute which includes dropping our daughter off at her daycare. Higher gas costs have certainly hurt when I put over $60 in to our 4 cyl Accord, but fortunately we only fill the car up every 2 weeks. I buy gas twice a month. (honda element 4 cly) I am aiming for less next month. As gas goes up I drive less. I’ve also spend the last year arranging my work with in 15 km of my home. (I’m a community based social worker, I have to drive for work) We also decided to spend a little more on housing to stay in our area because the better half’s work and my main office is close. I walk or bus every chance I get and shoot for couple of car free days. I love to hear people complain about the price of gas, while walking around with a $1.50/litre bottled water…if only gasoline came free from our taps too! The only thing higher gas prices made me do is to buy an oil and gas income trust as a hedge against higher prices. This was really the only option for me as the drive to and from work is too far (for most, including me) to bike. Transit where I am is not an good option for me either. To move closer to work to avoid a commute makes no sense for almost everyone. So getting monthly income or dividends from the companies you are giving your gas money to makes sense to me. I probably would have not done this if it were not for the high prices. 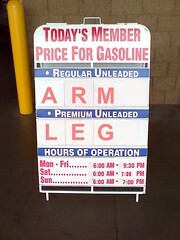 I agree.The price of gasoline nowadays really is becoming sky rocket high. I and the wife are car-pooling so we have not changed our driving habits. We only have 1 car so things can get dicey at times but we have always managed to work it out. We both have bikes at home so we can make a quick run to the grocery shop without relying on the car. I am thinking of giving my current car (93 Camry) to my dad and get something else more recent. Thinking of taking a plunge and get something more luxurious like an Audi or a Saab, not brand new but something like 2000-2003 models. I have always been a Toyota guy but I guess you only live once. Even now, 2 years after this article was written we are at $3/gallon average in my state. People still drive and prices are still pretty high. For me and my family we have cut back on the amount that we drive and usually carpool with friends and other family members.